The branch line from Rolleston (on the Midland Railway's Nottingham-Lincoln line) to Southwell was opened in 1847. At first, passenger services were horse-drawn, there being just one per week upto 1853. Steam did not arrive until 1860. In 1871 the line was extended beyond Southwell to Mansfield, bringing the total length of the line to 12 1/2 miles (single track). The original wooden station at Southwell was replaced by a stone built one. The passenger service to Mansfield ceased in 1929, but the single carriage Rolleston to Southwell 'Paddy' (as it was known) continued running until 1959 - fully 112 years of service to local people. Thereafter the line continued to be used by coal traffic and some excursion trains until 1965. 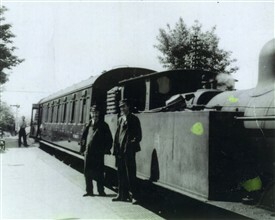 Typically the 'push-and-pull' Paddy service from Rolleston to Southwell (1929 - 1959) - all of 2 1/2 miles in each direction - was hauled by an 0-4-4T eight-wheeled, four-coupled tank engine (as pictured here) - probably the most popular type used by the Midland for local passenger working. At the time of grouping in 1923, the Midland had no fewer than 226 of them, the largest total of any company. From 1936 until moving to Colwick depot in 1940 Jack Wright was a fireman at Nottingham LMS. There were four drivers and four firemen based at Southwell and when a fireman was holidaying or off sick we would be sent to Southwell to substitute for them. In addition to morning and afternoon turns on the push and pull to Rolleston and back, they also worked to Newark Castle and shunted the yard. There was a small loco shed at Southwell that could accommodate two small engines, where, of course, the push and pull engine was put for the night. [Mr Wright's memories were recorded in a letter he wrote to the Newark Advertiser newspaper, published in its edition of 10th October 1997]. Mr Kenneth Tweedale-Meaby, Clerk of the Peace and Clerk to Nottinghamshire County Council, lived in Southwell (latterly in Burgage Court) and used to Paddy for his daily commute to Nottingham. On one occasion, it is said, when the train went without him, such was his status that it was brought back to Southwell to collect him. His connecting service was likewise held at Rolleston whilst he made his way there. This page was added by Website Administrator on 15/12/2015. One fact that might be of interest is when the line opened to Mansfield a through service was offered to Buxton, supposedly this was influenced by the Bishop of Southwell, but this service did not last long. The service took about 40 minutes to travel from Southwell to Mansfield, another rumour was that it was possilbe to get off at Rainworth, go to the local pub consume a few pints and still catch the train to Mansfield it was that laid back. Nothing goes into detail about the actual paddy train - push and pull means that the engine pulled the coach in one direction, going back the other way the engine pushed the coach - this was a special coach fitted out with controls, the steam engine basically being controlled from the front carriage by the driver, saves a lot of time not having to uncouple the engine. Another example was the Penny Emma from Sutton Town station to Sutton Junction, which was a similar setup. If you want to see this in action look on U-tube under Southwell to Mansfield railway and there is some rare footage of the push and pull in action on the last day of operation, which explains how it operates. Coal gave the line a bit of boost with Blidworth and Bilsthorpe collieries opening in the 1920s which made the LMS double the line from Rolleston to Southwell.